Okay, Father’s Day is over, but it doesn’t have to be. Any day can be Father’s Day, right? 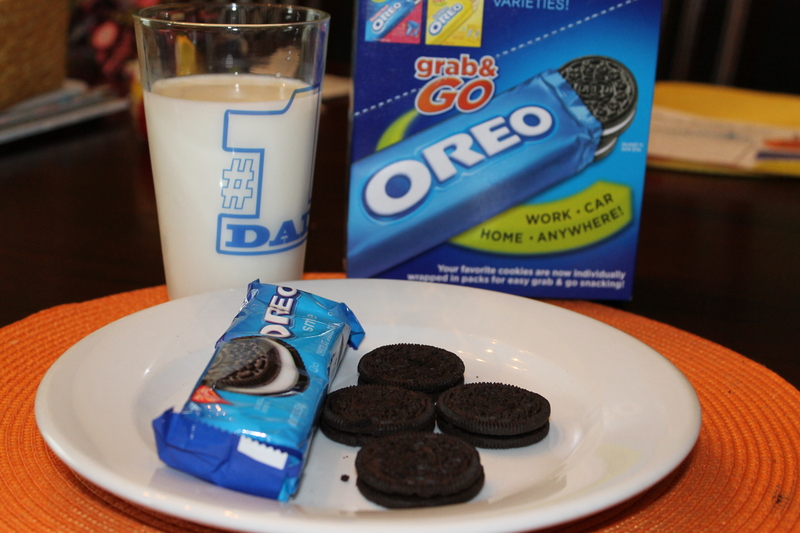 What better way to celebrate your dad than with Oreos!! We love Oreo Cookies in this house. When I was asked to share the above e-card and receive an Oreo gift pack, how could I refuse? I was sent a package with Oreos, a number 1 Dad glass and a gift card to buy milk! How fun! My husband loves to dunk his Oreos into milk. Let them sit for a few seconds and then eat! My son and I eat them the same way. My daughter on the other hand will take a cookie dunk it fast and take a bite, then drop the cookie in the cup. Then do the same to the other three cookies. 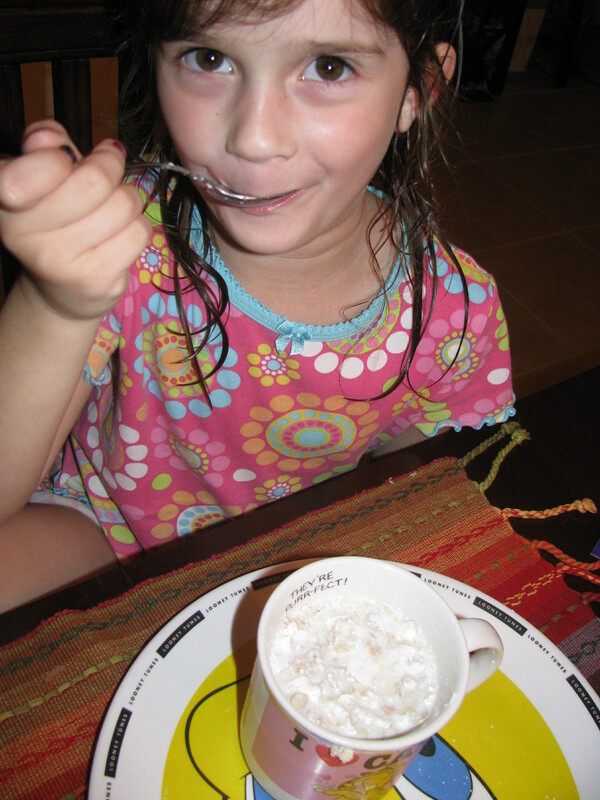 Then she will crunch them up in the cup and drink it like that. She does the same thing with those little white donuts (above). Would you like to win an Oreo Gift Pack? One Mommy Has to Work reader will win the same package I was sent. See details below. I was sent a gift pack to review. All opinions are my own. My kids chose a present to give him and we went out for breakfast. I made a book with letters from the kids and photos of them and him. He loved it! Gave hubby a day to relax and the girls made him presents. We gave Daddy something he loves–beer! Craft ale to be exact, all wrapped up with a Foo Fighters t-shirt! That’s how we roll. We made a very special card for my stepfather. He was in a doo-wop band called The Illusions in the 50s and 60s. We downloaded band photos and used words from his songs. He was thrilled (and a little choked up!) Success! Daddy had breakfast in bed. We made his favorite dessert. we took him out for a nice dinner. I took my husband out to dinner and made him his favorite brownies! In my father’s memory, my hubby and I try to visit a truckstop diner for Thanksgiving or Christmas eve every year; Dad loved doing this- he was a trucker. We got rid of “Dad”!! Just kidding, we sent him golfing with his buddies…. he loved it! We had a family BBQ at my parents’ house. We made my husband a nice dinner and gave him some gifts like a gift card to go golfing and a photo book that we made for him. We just give Dad a relaxing day at home. We went out for a special meal. We took my dad fishing, and treated him to dinner at his favorite restaurant. I got my father a card and gift. We went out to eat after church. I made breakfast and my kids made homemade cards. We Enjoyed A Picnic In The Park! We spent the whole day with all the dads in the fam! We went out to eat and watched a movie. I got my hubby a hammock chair! He loves it! make a homemade breakfast and their favorite dinner meal. Our father is deceased so we treated our brother to his fave restaurant – thank you. Our whole family went to my dads house…and we grilled outside for him this time and did all the clean up! It was his day to relax! My parents left for a vacation the day before Fathers Day this year, so we took my dad out for dinner the Friday before. Thanks fro the giveaway! We made him a tool caddy and we took him to see a movie! We celebrated by giving my husband gifts and having a BBQ. Thanks. I took my dad on a fishing trip. we had a great dinner and then went to the movies! Gave my husband a card and gifts from the furbaby (we have no children) and made him lasagna. We had a backyard bbq celebration for dad. we always go out to eat! We let him watched whatever he wanted on tv, we watched nfl network ALL day! I work a lot, so mothers day and fathers day are two days we always spend together. A home cooked meal all of his favorites. We had a cookout, but it was for me because I’m the mom and dad around here!